RIM today launched a social networking site to discuss all things Blackberry. Titled MyBlackberry, the site is discussion-based where users can share information, vent on frustration of using BB, review or discuss new features, etc. As a Blackberry owner, I am excited to be able to connect to other like-minded persons. Lets see how useful and relevant it remains over time. What is your mobile platform strategy? In the beginning there was the PalmOS mobile platform, and then there was Symbian, then Windows Mobile and RIM’s Blackberry OS. Then came the juggernaut iPhone OS from Apple. That was followed by Android from Google. Soon Palm will launch another mobile platform called the WebOS. All these different platforms lead to a question: How many mobile platforms can your company support? That is just the operating systems. Already the mobile industry is fragmented with dozens of smartphone manufacturers. Add in the different features of the handsets themselves, like accelerometer, GPS, camera, etc, and you have a whole matrix of feature sets that need to be accounted for. It is amazing how often entrepreneurs and product managers at smaller companies have said to me that this is their strategy. Then I ask them how soon they will be on all these platforms and I get a vague answer of as soon as we can. Given this situation, how long can companies justify developing products for all platforms? Companies really need to evaluate their strategy against their resources. Building and supporting products on multiple platforms is costly and labor intensive process, just ask all those who build and support PC and Mac products. The complexity increases multiple-fold in the smartphone space. As an entrepreneur or product manager, you don’t have the time to wait until the product has been tested on all the platforms. You need to be out in the market before your competition. Considering the limited funding and resources, you have to decide on one or two “hero” platforms as Tim Westergren, founder of the popular Pandora music service calls them. He has decided that iPhone is the “hero” platform they will focus on and when WebOS from Palm is available, that will be its second “hero” platform. There are definite benefits in this strategy: You can develop a product that leverages the various features of that platform. You are able to conserve your resources by developing on few platforms. You can become the “best-in-class” on the specific platforms. On the flip side, though, you have to weigh how successful are your target platforms going to be. iPhone has done phenomenally well and therefore could be a no-brainer for a lot of us. However, if you were targeting say Android or even the much-anticipated WebOS from Palm, you just have to look back at all those folks who jumped on the PalmOS bandwagon and decide if the rewards outweigh the risk and what is the likelihood of the platform surviving a few years. Once you have decided on the platforms, like all good strategists, keep evaluating them and your strategy. Tim Westergren did not embark on his strategy right from the get-go. In fact, for two years Pandora was available on AT&T and Verizon Wireless’ application stores where it languished. Only when iPhone came along and Tim decided to launch his product on that platform did he found success. Verizon Wireless and RIM had promised there would be ample Blackberry Storm devices for all customers. However, that was not the case. This morning I went to get the phone at 6:30 am to wait in queue. I was about the 25th in queue. Shortly, before 7 am the store manager was out with a writing pad informing people after about the 15th person or so that they were not going to have enough on hand, another shipment was on its way and he would take down the customers’ phone numbers and call them when it was in. Even then you were not guaranteed the phone. You had to make it out to the store within 15 minutes of receiving the phone call otherwise you were out of luck. So, what gives? Well, Boy Genius Report had some early information yesterday saying that Verizon would not be able to meet the demand. Apparently, according to Verizon, it was RIM’s fault that they were not able to ship enough devices. To me, that just is the Big Red pointing a finger at the manufacturer for its inability to estimate the demand and not having a strategy in place to meet the rush for the device. I have been with Verizon for a while, but right now, I am really pissed at them for bungling perhaps their best opportunity to take on AT&T and Apple iPhone. No matter what success the Storm has, I think, this experience will forever be associated with the launch and perhaps hard to live down for Verizon Wireless and RIM to a degree. And I thought I had it bad, until I read the plight of one of our reader who was lied to twice and is very annoyed at Verizon right now. You can read about his encounter here. Here’s our honest to god non-biased conclusion… this is the best phone to ever touch Verizon Wireless so far. If you’re a Verizon Wireless subscriber and a dumb phone won’t cut it, you’d be pretty air-headed to not pick this bad boy up above any other smartphone in Verizon’s lineup. The selling points are easy: the phone is gorgeous to look at and hold, it’s designed and backed by RIM (now almost a household name thanks to their prevalence in the business and entertainment markets), and it’s packed with features that, at first glance, make it seem not only as good as the iPhone, but better. The only hitch in this plan is a major one: it’s not as easy, enjoyable, or consistent to use as the iPhone, and the one place where everyone is sure they have an upper hand — that wow-inducing clickable screen — just isn’t all that great. So, as I said, if you are indeed planning on getting this phone, decide the features that are important to you, read the reviews, take notes, and then make the decision. Here is an excellent hands-on review of the Blackberry Storm that Verizon is launching this week. The reviewer has done a great job of highlighting the key features of the phone and is definitely worth the 6 minutes or so to review it if you are in market for the Storm. How does Blackberry Storm stack up against the Apple iPhone? The CIO magazine has done a very interesting comparision between the Apple iPhone and the RIM Blackberry Storm. Instead of arguing for one over the other, they have put up reasons in two separate articles outlining the strengths of each phone and letting the readers decide. Though these articles do not break new ground, as one reader mentions, they just help someone, who has already made up their mind about one or the other, articulate the reasons why one is better than other. For reasons why Blackberry Storm is better than Apple iPhone, click here. For reasons why Apple iPhone is better than Blackberry Storm, click here. I have to disagree with the CIO magazine on one point. 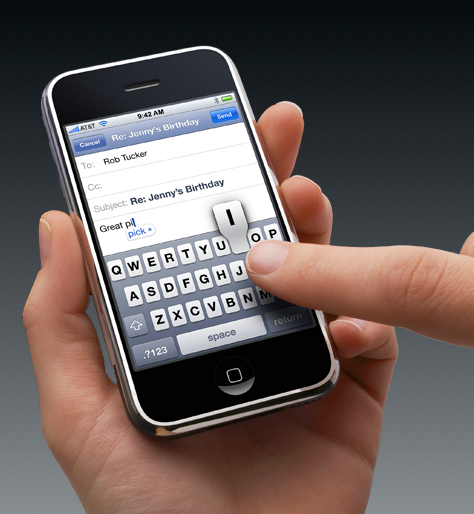 According to them, the Apple’s virtual full QWERTY keyboard which is available in both landscape and potrait modes, is one reason in favor of the iPhone. However, I feel that for use with touch, it is difficult to type on a full QWERTY keyboard in potrait mode. 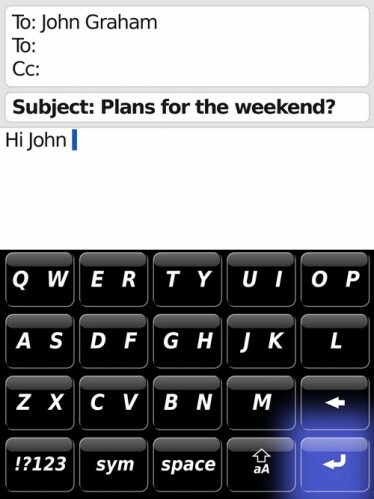 There can be numerous errors due to small keys in potrait mode and a new user would not fare any better than using the SureType keyboard found on the Blackberry Storm.